Plastic Surgical Associates makes it easy to pay for your procedures and treatments. CareCredit financing plans are available. At Plastic Surgical Associates, we accept a variety of payment options: cash, check, cashier’s check, Visa, Mastercard, Discover and American Express. We also offer a 4% discount to our patients for payments made with cash/check/cashier’s check. Financing is available through CareCredit. 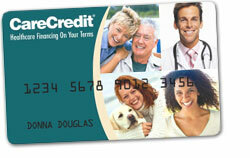 We offer financing plans through the CareCredit Card. These financing plans make it easier for you to get the aesthetic procedures that you want and help you get closer to your goals. Through the CareCredit Card, we are able to offer patients a wide variety of payment plans to fit your needs, from 6-18 month deferred interest plans to extended payment plans. If you open up a CareCredit Card account, you can use your account now to pay for procedures that you may want in the future without having to go through the hassle of reapplying. Applying for a CareCredit Card is simple and fast.